The Casabela Hotel’s favourable location at the estuary of the River Arade affords panoramic views across the water to Portimão and along the coast. The picturesque fishing town of Ferragudo and a number of beaches are within easy reach. Facilities include a heated open-air pool, large gardens, tennis court, snack bar, bar and restaurant. located to the west of Carvoeiro, close to the Pestana golf courses. The 5-star hotel operation of the resort offers 22 well-equipped rooms plus 80 self-catering apartments. Facilities include a health club with a heated indoor pool, a spa and an impressive outdoor pool area alongside an artificial lake, and the Olive Tree restaurant is certainly worthy of mention. Located close to Carvoeiro, this 5-star resort features modern Mediterranean architecture and exclusive services such as a Ritual Spa, restaurant, paddle and tennis courts, putting green, an Astroturf multi-games area, a running track and indoor and outdoor pebble pools. The fully equipped 73 townhouses and 12 villas are surrounded by lush gardens, several ponds and a running creek that complement the resort’s ocean views. offers a restaurant and lounge bar. This well-established hotel is conveniently located in the heart of Carvoeiro only 25 metres from the beach and within easy strolling distance of shops and restaurants. All 54 rooms have en-suite bathrooms and are equipped with satellite TV, air-conditioning, telephone, tea and coffee-making facilities and many enjoy pleasant views of the coastline. There is a restaurant serving traditional Portuguese cuisine, terrace bar and heated swimming pool. This hotel enjoys a central position in Carvoeiro 600 metres from the beach and near to Vale Centianes beach. Facilities include a restaurant, cocktail bar, outdoor pool, heated indoor pool, sauna, Jacuzzi and a garden with palm and coconut trees. The accommodation comprises 110 rooms, 20 junior suites and two senior suites, all equipped with mini-bar, air-conditioning, telephone, satellite TV, safe and balcony. 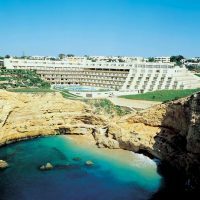 Located within easy walking distance of Carvoeiro town centre, this hotel has its own bay and there are various beaches nearby. Facilities include indoor and outdoor pools, Jacuzzi and a health club with sauna, Turkish bath, fitness room, massage and beauty treatments. There are two floodlit tennis courts and a scuba diving centre. This 118-bedroom hotel enjoys a cliff-top location just 300 metres from the beach. Most of the rooms have ocean views and are equipped with direct telephone, air-conditioning, kitchenettes, satellite TV and have a terrace or balcony. Facilities include a restaurant, bar with live entertainment, pool bar, gym, sauna, Jacuzzi, Turkish bath and games room. There is a courtesy bus service to Carvoeiro 1500 metres away. In a peaceful country setting just a few minutes’ drive from Lagoa and within easy reach of the beautiful Praia da Marinha beach, the resort offers a choice of suites in the main hotel building and self-catering townhouses set in clusters in the gardens. Facilities include a tennis court and a well-equipped beauty spa featuring massage rooms, sauna, steam room and Jacuzzi. There are two outdoor pools (one heated) and a restaurant on site. Located on the outskirts of Silves just a few minutes’ walking distance from the town centre, this recently refurbished 57-room hotel is set in attractive gardens with fine views to Silves’ famous castle. Facilities include pools for adults and children and two restaurants. The rooms are air-conditioned with satellite TV and direct telephone. The nearest beaches are 12km away. With just 14 individually decorated rooms across two traditional buildings, this boutique hotel, located between Porches and Armação de Pêra, combines comfort, charm and tradition. Featuring all mod-cons alongside personal touches, such as free use of bicycles, use of local produce and weekly wine tastings, the hotel has a lounge, bar, an outdoor swimming pool and Jacuzzi heated all year round, and various sun terraces. Open February to November. 2 outdoor seawater swimming pools (1 heated in winter) and 3 freshwater pools. Accommodation is in suites or apartments. Vila Vita Parc is an exclusive cliff top resort. Facilities include watersports on the beach, créche, kids and teen club, indoor and outdoor pools, floodlit tennis courts, a 9-hole pitch & putt golf course with driving range and the Vila Vita Vital centre for health, beauty and natural medicinal therapies. There is an impressive selection of bars and restaurants, including the 2 Michelin-star Ocean restaurant. Guests can also make use of the resort’s own yacht.